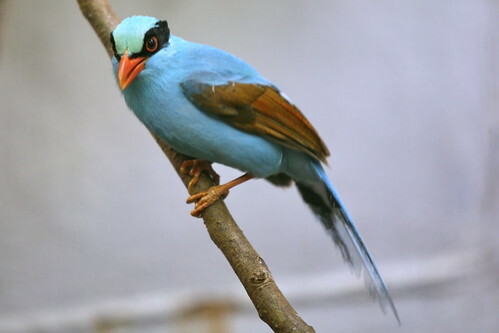 Green Magpie (Cissa chinensis), originally uploaded by cliff1066™. The Green Magpie is a member of the Crow family, roughly about the size of the Eurasian Jay or slightly smaller. It is a vivid green in color, slightly lighter on the underside and has a thick black stripe from the bill (through the eyes) to the nape. The tail is quite long and tapered with white tips. This all contrasts vividly with the reddish fleshy eye rims, red bill and legs. The wing primaries are reddish maroon also and make this one of the most striking and distinctive members of the whole family. It is found from the lower Himalayas in north eastern India in a broad south easterly band down into central China, Malaysia, Sumatra and northwestern Borneo in evergreen forest (including bamboo forest), clearings and scrub.